This is a quick book review of the Wool Series Omnibus, written by Hugh Howey . The Wool indie book series is quite the find. I had just finished up The Forever War (An amazing read in and of itself) when I was looking for something as fascinating or entertaining and I had found it with Wool, and its subsequent sequels. 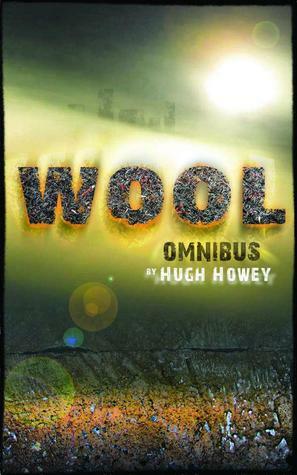 The Omnibus is the collected volumes of Hugh Howey’s five book series titled Wool . It first appeared in July of 2011 as a short story but when readers wanted more, Hugh put out four more short stories to fill out the story. And oh, what a story. That seems simple enough, but don’t get too comfortable when you're reading Wool. If you can imagine a society that has relegated itself to living in huge underground constructs called silos, all because of what mankind has done to the environment, that's Wool. Or at least the nice part of it. Every aspect of life is taken care of within these silos and it has to because the world outside is a hostile, caustic atmosphere that can kill you. And that’s not a good thing . Wool cleanings are reserved for those who commit grievous crimes or feel like they can survive on their own on the outside. The present silo governments designed a program where they take the criminals or the crazies, put them in suits specifically designed for the task of going outside, and supply them with the tools necessary to clean the lenses of the cameras . The odd part about this entire process is, that no matter what the cleaner says or threatens before going out, everyone to a tee, always cleans the camera lenses before their suits give out. It’s pretty confounding to everyone inside the silos, including this reader. But each cleaner gets their wish as they set on their one-way journey. They clean the lenses and then start walking, in the hopes they can get somewhere before the atmosphere rips at their environmental suits . Whether they get one foot, fifty feet, or more on their short journeys is completely up to them. And therein lies the story, or at least the start of it of this amazing curious mystery. The rest of the Wool Omnibus series rocks. We’re tempted with past uprisings that no one really knows about… except that they seem to happen. We’re tempted with so many potentials it’s crazy, but keep something in mind: Be quick on your literary feet. Hugh Howey fills this book with wonderfully expressive detail that takes no prisoners when it comes to setting the scene, from the environments to the mindset of our characters. He touches on things that you might be thinking of in that same situation, but then you think, hey, that’s pretty insightful. But these moments of detail also can kill you because more often than not, they’re used to build a horrendous amount of tension because Hugh likes to mess with our minds and keep us waiting while we build to moments of revelation or an immediate resolution of that moment’s plot… each time. Grr. But for the first time in my life, I’ve said “Whoa!” or “Oh my god!” out loud, from reading a book and that’s due to how the characters yank you right in and it’s from all that damned, deeply detailed style of Hugh’s. Wool is a good book. I can’t say much about this without giving away spoilers but Hugh keeps you on your toes. Things you think are set in stone, become dust in the wind. Things that you just start wrapping your mind around and accepting as part of the story, well, don’t get too attached. Whether he does it once or fifty times, I can’t tell you. That’s for you to discover. But he definitely keeps you engaged and worried about characters and settings. When I finished the Wool Omnibus, I started to panic and go into withdrawals, knowing that for the moment, this story has come to a close. I headed right out to Amazon and found that there’s a 6th book of his “Silo Series” titled First Shift – Legacy. It’s a prequel and I finally find some answers into how this entire world of underground silos got started. Word of warning: Don’t buy the prequel book first. Read the first series and experience being mystified, then go get some answers in the prequel. And yes, almost right away, the title will make sense. I started reading these after your initial review , i only have 3 books, now you mention there are 5? My wife may kill me if i buy more books to add to the night stand..